We’re not saying that this monkey is magic. We’re just saying that it doesn’t like people, and the guy for whom it is named promptly died of dysentery. Be advised. 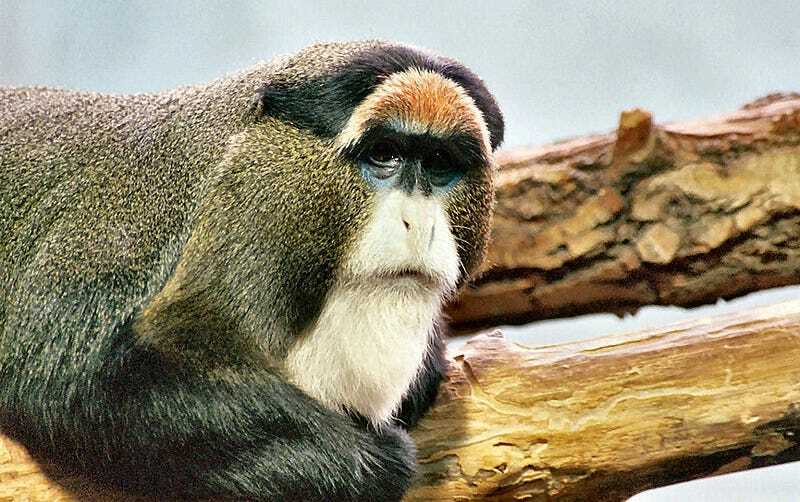 The De Brazza’s monkey is common, but not easy to find. It spends as little time on the ground and in the open as it possibly can. When it does forage on the ground, it stuffs most of its food into cheek pouches (displaying sleight-of-hand) and then runs into the trees to savor the food later. The monkey is named for Pierre Savorgnan de Brazza, a great French explorer and governor. How did he get associated with this shy and retiring monkey? I wouldn’t go as far as saying that he was a wizard of equal standing, and possibly in the same clan, but look at the beardevidence. Uncanny, no? In all seriousness, De Brazza seemed to be a decent person, as colonial conquerors go, which makes it a shame that he died under mysterious circumstances. Some say he was poisoned. Others said he simply died of dysentery. De Brazza’s monkeys are most notable—after their glorious white beards—for their clannishness. While most monkeys will turn on any new group that comes in their territory, De Brazza’s monkeys don’t care if another group of De Brazza’s monkeys move in on their land. The two groups don’t merge, since these monkeys like to stay in small clans, but they coexist without hostility. If another kind of monkey ventures into their territory, all bets are off. The clan descends on the interloper, shrieking and fighting, sometimes physically throwing the non-De Brazza out. For the most part, though, they’re just ghosts. They live in sparsely-inhabited swamps, they freeze if they’re spotted, and they slip away as fast as they can. Even if zoos, they’re not easy to see. And considering what happened to their namesake, that might be a good thing, for they are subtle and quick to anger. Top Image: Lea Maimone. Second Image: Steve Wilson.